Many people think of tyres as simply another recurring expense, to be avoided or minimised where possible. The truth of the matter, though, is that your tyres are one of the most carefully engineered and vital components of your car. They have a crucial roll to play in braking and steering, they are essential for traction in slippery conditions and play a major roll in reducing road noise, improving ride comfort and overall handling. 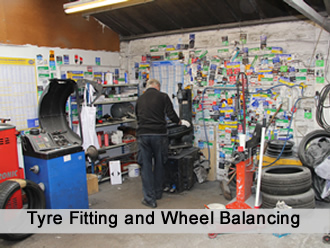 We can obtain virtually any tyre required and can provide most standard sizes from stock. Whether you require budget tyres for a local run-around or something top-notch for a Lamborghini, we are very happy to advise. It is most important to have well matched tyres on each axle, so if you end up with a mix of brands we are more than happy to move wheels around and check wheel balance to give you the best possible driving experience. We are, of course, also equipped to check and adjust your wheel alignment (tracking) to ensure that you get the maximum life out of this important investment. 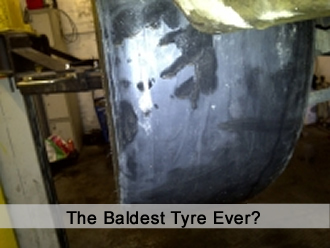 The bald tyre in the picture is not, in fact, one of the "slicks" used in Formula 1, but was one of four tyres without a trace of tread between them. The car belonged to a high mileage sales rep who was completely unaware of the problem and had actually brought the car in for new wiper blades! He was obviously very lucky not to have needed to stop suddenly in the wet, but this does underline how important it is to check tyre condition with reasonable regularity. Some tyre suppliers offer tyre inflation with purified nitrogen. We feel that this is of minimal benefit and an unnecessary expense, a view the AA appear to agree with, see their statement!